Premium synthetic oil with suspended PTFE Teflon particles that bond to surfaces to add lubricity to moving parts. Used for applications which allow parts to be confined (I.E. gear box). Use it as a general purpose lubricant for industrial machinery and equipment. 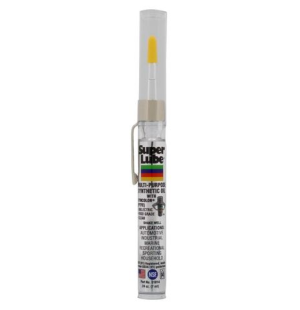 Super Lube Oil with PTFE Teflon provides long-life protection against friction, wear, rust and corrosion. Machinery lasts longer, downtime is reduced, and productivity is increased. Safe on metal, rubber, plastic, wood, leather, fabric and painted surfaces. This Product Is Waterproof, Non-toxic (USDA Rating H1) And Contains PTFE Teflon. It Reduces Friction & Wear, Is Long-Lasting, Extends Machinery & Equipment Life And Reduces Maintenance. Viscosity Stable.